State troopers Ethan Brandt and Gabriel Donnelly are finally going to get their storybook wedding—sailing on an ocean liner to a castle in the English countryside! But when an Icelandic volcano scrambles flights all over the world, they must find alternate routes to the altar—separately. Donnelly meets Sandler Birkin, a globetrotting courier who specializes in carrying rare artifacts and diplomatic pouches. He pulls a few strings to get Donnelly to the ship on time and then accompanies him across the Atlantic. Donnelly returns the favor by helping to find Sandler’s long-lost first love, Trevor Hendricks. Trevor's controlling, homophobic parents have brought him to Europe for a radical treatment to cure him of his homosexuality—and his love for Sandler. Brandt, meanwhile, finagles his way around the globe with the help of Kerry Mercer, a sales executive whose spirit of adventure leads her to accompany him on his improvised journey. However, sharing hotel rooms with her presents a problem for Brandt who, despite being about to marry a man, still finds her attractive. Once Brandt and Donnelly are reunited, they band together with Kerry and Sandler to plot Trevor’s rescue. But doing so might mean missing their own wedding. I have been waiting for this wedding for far too long! When Icelandic volcanoes disrupt the grooms and guests travelling to Brandt and Donnelly’s long awaited wedding in an English castle, the result is an epic road trip across two continents. This really isn’t my favourite story in the series. Brandt and Donnelly are separated for most of the story and their miserable self-doubt, constant whinging, and ceaseless sexual identity issues grow tiresome very quickly. Thankfully, there are other, reliably amusing characters in these books. Bryce and Nestor completely steal the book with their plan to travel West to get East, exchanging sexual favours for passage on every imaginable form of transportation. These two are absolutely brilliant and for the first time, they really become dynamic, engaging characters. The wonderful mélange of quirky characters and caricatures our men meet on their travels is equally fabulous and the unexpected additions almost completely make up for the more somber Brandt and Donnelly this time around. The ongoing commentary on sexual politics that is usually light and funny becomes incredibly heavy handed and preachy by the end of this book. Between scenes of pretty boys frolicking in a hot tub and airline pilots, truckers, and farm boys enjoying certain favours, topics like arranged marriages and gay conversion therapy are randomly dropped into the story and explored in gritty detail. For me, the overall result is a sort of literary motion sickness. The plot itself is rambling and a little disjointed – a tiny subplot about Donnelly’s travelling partner, Sandler’s first boyfriend, explodes and manages to dominate the last third of the book. Sadly, this very long story melts into a disappointing and vaguely confusing puddle by the end. There were enough moments of brilliance here to keep me reading, but this doesn’t quite live up to the rest of the books in this fantastic series. 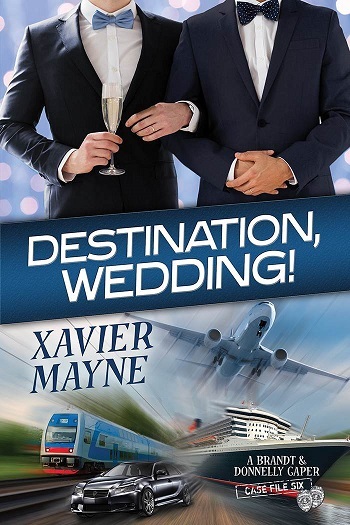 XAVIER MAYNE is the pen name of a writer who has been both a university professor of English and a marketing professional for software companies. He currently manages a team of writers for a large technology company based in the US Pacific Northwest. Versed in academic theories of sexual identity, he is passionate about writing stories in which men experience a love that pushes them beyond the boundaries they thought defined their sexuality. He believes that romance can be hot, funny, and sweet in equal measure. The name Xavier Mayne is a tribute to the pioneering gay author Edward Prime-Stevenson, who also used it as a pen name. He wrote the first openly gay novel by an American, 1906’s Imre: A Memorandum. Unique among early gay novels, it tells the story of two main characters who are straight until they meet each other. Reviewers on the Wicked Reads Review Team were provided a free copy of Destination, Wedding! (Brandt and Donnelly Caper #6) by Xavier Mayne to read and review.